We closed out the position players with right field this morning. Now we move to the pitching side, starting with bottom half (16-30) of the starting rotation rankings. There are some easy similarities to be found between the clubs on this list. There are several that have one or two generic, No. 4 quality veteran arms without much raw stuff. The better clubs have a couple more No. 4 types beyond that, with either durability or track record as the concern, while the lower-ranked clubs have a bunch of lesser, unproven prospects and guys who should top out as sixth starters or long relievers. One of the more interesting clubs is Toronto, which has two young starters who have shown No. 2 or 3 upside (Marcus Stroman and Aaron Sanchez), three veterans with consistency or durability issues on one-year deals (Matt Shoemaker, Clayton Richard, Clay Buchholz), a couple of intriguing prospects who can contribute in some way this year (Ryan Borucki, Sean Reid-Foley, Trent Thornton), and a few depth guys. Cincinnati falls along the same lines, with Luis Castillo as the anchor and Anthony DeSclafani as the injured but talented second piece, then three veterans in walk years (Sonny Gray, Alex Wood, Tanner Roark), and some post-hype prospects (Tyler Mahle, Cody Reed, Michael Lorenzen, Lucas Sims, Sal Romaro). On the younger side, both the Padres and the Braves could have a full rotation of recently-graduated prospects, though the Braves probably won’t with Julio Teheran, Kevin Gausman, and Mike Foltynewicz likely taking up a couple of spots in the rotation while the kids fight it out for what is left. San Diego’s top five in projected innings were all prospects at this time last year except for Matt Strahm, who’d only lost his eligibility by a few innings. Behind them, the Pads have even more young arms coming, with Mackenzie Gore, Luis Patino, Adrian Morejon, Michel Baez, Anderson Espinoza, and Ryan Weathers all within a few years of possibly reaching their mid-rotation or higher potential. 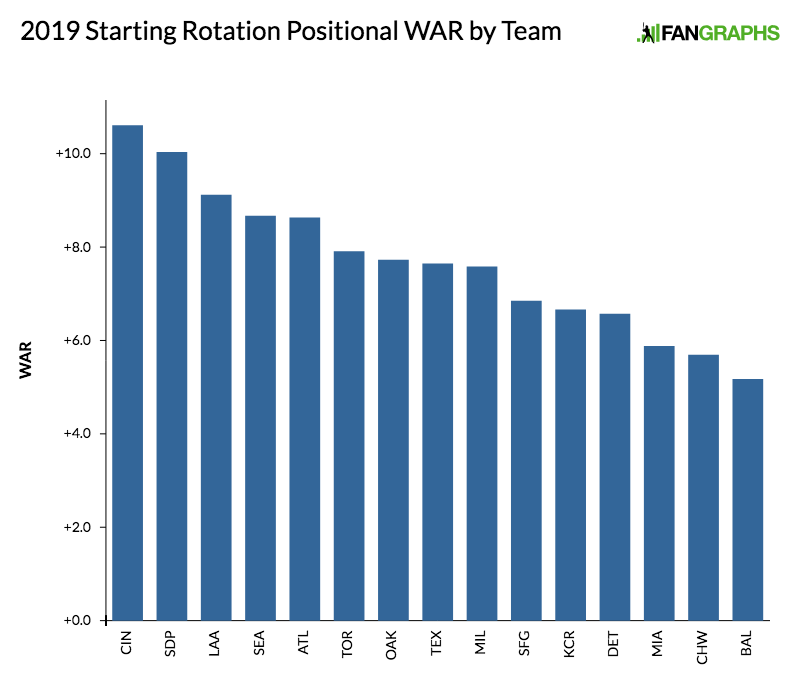 We hoped you liked reading 2019 Positional Power Rankings: Starting Rotation (No. 16-30) by Kiley McDaniel! Strahm was acquired at the 2017 deadline not the 2018 deadline.